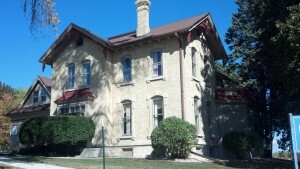 Senator William Blair House | Waukesha Preservation Alliance, Inc. Constructed in 1876 for William Blair by Samuel Dodd, the house is considered one of the finest examples of classic Italianate style in the city. The house is listed on the National Register and is eligible for tax credits. William lived the American dream. He came to America as an immigrant and developed into a highly respected businessman and civic leader. William Blair served as state senator in WI for 6 years; he was stockholder, president, and director of the State Bank and Waukesha Co. National Bank; President of the Village Board for many years; and long-time trustee of the Wisconsin Industrial School for Boys. February 6, 2014 UPDATE: The Blair house 434 Madison Street is officially on the market. The city is currently accepting proposals. The zoning could be residential or B4. If you would like a copy of the RFP contact Steve Crandell in community development at 262-524-3754 or scrandel@ci.waukesha.wi.us. The property was deeded to the city when Henry Blair died in the 1950’s. It has had various uses over the years. The latest use was for medical clinics for Pro Health Care which leased it from the city. Pro Health no longer needed the building and none of the departments in the city had any use for it, so it is being sold. March 17, 2015 UPDATE: The Masons continue their lawsuit against the City of Waukesha. Claiming that the City of Waukesha has violated the conditions set forth in the will of Henry Blair, they claim the property should revert to the Masons. During mediation, the Masons brought forth an offer from one of their members to purchase the property. Common Council considered this offer on Tuesday. Unfortunately, we did not hear about it until last minute. Thank you to the Tower Hill neighbors who came out to the meeting last night to oppose the demolition of the Blair house. The Masons claim that the house is in deplorable condition. It is not in deplorable condition. The Salbs who were in the process of purchasing the house from the city when the lawsuit was filed, were able to prove that the house is in good condition with pictures and Lisa Salb’s expert opinion as an architectural designer. Thank you Salbs for being so dedicated. The next court date is April 9th.